Circularity and Resource Efficiency of Food Systems Conference (May 22, 2019 / Bucharest, Romania) - foodforces Webseite! Welcome to the Circularity and Resource Efficiency of Food Systems Conference under the Romanian Presidency of the European Council! 3 years ago, we decided that we want to give food and agricultural SMEs something more. We knew that they produce quality and especially tasty foods, but we also knew that they are facing different challenges in the area of mechatronics, food design, food safety and labelling. This is why 5 regional partners and 4 knowledge partners, coordinated by Technology park of Pomurje, joined their forces and thus, the project I-CON was launched. During these years, we tried to help as many SMEs as possible either with knowledge transfer and by sharing and using different tools, as well as with concrete solutions from mechatronics, design, food safety and labelling. Together with SMEs in different countries, we prove that even despite their smallness, SMEs should easily say “I-CAN” to any challenge that comes in their way. As I-CON project is coming to the end, we kindly invite you to participate to our I-CON FINAL CONFERENCE where we will present and discuss about project experiences and achievements. 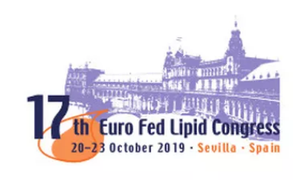 The next edition of the EuroFedLipid Congress will take place in Seville on 20-23 October 2019. Seville is the perfect arena for hosting scientific and technological discussions on lipids, showing the latest and most innovative results, and setting the basis for a new horizon in research. We expect to meet you and share knowledge and experiences. Don't miss it! Why would anyone want to come to Seville for a congress? You'll find the answer in our blog. Wageningen University is organizing an Innovation Contest open for all students and student start-ups over the world. The theme of this contest is the protein transition and the students are challenged to submit a ground-breaking idea to meet the global protein needs in a sustainable way. During the contest the student(s) will be coached by the private, pubic and/or academic sector to develop their idea and to gain an once in a life time experience. The best three ideas and/or prototypes will receive a cash price. You can find more information on this website. In a 3-month period students submit and further develop their revolutionary idea related to one or more of following themes: - consumer behaviour; - new protein sources; - new protein foods; - processing efficiency (incl. conversion). Throughout the competition students intensively interact with coaches from the private and public sector as well as academia and follow a number of entrepreneurial-skills workshops. ICOAS brings together scientists, advisors, entrepreneurs, policy makers, associations, non-governmental organisations and other stakeholders to meet and discuss latest research results and developments in organic agriculture in Central and Eastern European countries. ICOAS fosters the strong partnership across stakeholders in Central and Eastern Europe. Knowledge dissemination and capacity building along the value chain in Central and Eastern European countries are the main focus of ICOAS. Therefore, ICOAS actively contributes to the promotion of research and innovation in the organic sector. Share your knowledge, contribute to the lively discussions and foster your partnerships across Europe and beyond! Registration for the conference is open now – please click here! After the successful workshop on "Hands-on training on baking technology" on 21-23 November 2017, the ISEKI-Food Association in cooperation with the University of Natural Resources and Life Sciences, Vienna (BOKU), and the STAMAG GmbH will organise the next Workshop in Vienna, Austria on 07-09 November 2018. This is an initiative of the FooD-STA centre to involve industry in teaching, especially to train the teachers. The training will be conducted in English. The theoretical part will take place half day at the Department of Food Science and Technology at BOKU and the practical part the next two days at the bakery laboratories of STAMAG GmbH in Vienna/Austria. The aim of this 2½-day Workshop is to raise awareness of university lecturers on what is practically happening in the food industry, in order to provide students with the necessary knowledge and to involve industry in training the teachers. The Workshop is certified by the ISEKI-Food Association according to the EQAS-Food Certification scheme as a European Qualifications Framework level 4 course and Certificates of Attendance/Completion will be provided to all the participants. There is a limited space for paticipants and latest by 15 October 2018 people who have registered will be informed if the workshop will take place. 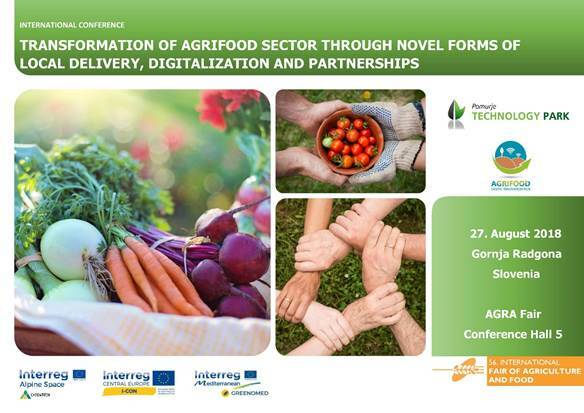 Pomurje Technology Park and ITC cluster (DIH AGRIFOOD) are organizing on 27th of August 2018 in the framework of 56th International Agricultural-Food Fair AGRA an international conference with an interesting topic under the title Transformation of agrifood sector through novel forms of local delivery, digitalization and partnerships. Together with eminent speakers from AGRIFOOD sector from South-East Europe region, we will highlight challenges, solutions and opportunities for the future of agrifood sector, with an emphasis on local delivery of quality food and new forms of cooperation, which shall speed up the process of digital and overall transformation of the sector. National Society of Processing and Energy in Agriculture (PTEP) and Faculty of Agriculture, University of Novi Sad are delighted to invite you to participate in the 6th International conference SUSTAINABLE POSTHARVEST AND FOOD TECHNOLOGIES. Faculty of Technology, Novi Sad. 11. Heating and air conditions. It is our great pleasure to welcome you to the 4th International Congress ‘’Food Quality, Technology and Safety and 18thInternational Symposium ‘’Feed Technology’’ to be held jointly within the framework of FoodTech 2018 event in October 2018, in Novi Sad, Serbia. Our biannual event traditionally combines great scientific content with stimulating lectures, networking opportunities and rich social programme, all sprinkled with smells and tastes of local food. Nevertheless, food is our focal point - food which provides us enjoyment and balanced and tasty nutrition. In the socially responsible world, the creators of food and feed strive to design food and feed not only to provide good health and long life, but to protect the environment, decrease poverty and, above all, cause consumer satisfaction. Innovation and innovative trends in food and feed science and technology are helping us to fulfil all these demands, and make this world a better place to live. The workshop, which gathers scientists from academia and industry, promotes the exchange of ideas and the discussion of new developments and possible new solutions in the field of nonthermal technologies for food applications, including high pressure processing. On the last day of the event there is a short course with a Field trip planned. 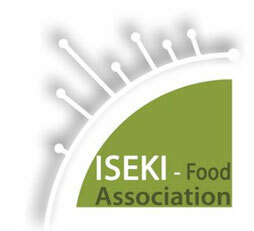 The ISEKI-Food Association (European Association for Integrating Food Science and Engineering Knowledge Into the Food Chain) and the University of Hohenheim are organising the 5th International ISEKI_Food Conference(ISEKI_Food 2018) to be held in Stuttgart, University of Hohenheim, Germany, 3 - 5 July 2018. The general aim of the ISEKI_Food conference series (Porto 2008, Milano 2011, Athens 2014, Vienna 2016) is to contribute to the creation of an "open" international forum for researchers, education scientists, technologists and industry representatives as well as food consumers, to promote constructive dialogue and collaboration on topics relevant to Food Science and Technology, Industry and Education and to present and disseminate the results of the activities developed by the ISEKI_Food network projects. We look forward to welcoming you in Stuttgart in July 2018!